"Since such is the nature of man that he cannot easily without external means be raised to meditation on divine things, on that account holy Mother Church has instituted certain rites, namely that certain things be pronounced in a subdued tone (canon and words of consecration) and others in a louder tone; she has likewise made use of ceremonies such as mystical blessings, lights, incense, vestments, and many other things of this kind in accordance with apostolic teaching and tradition, whereby both the majesty of so great a sacrifice might be commended, and the minds of the faithful excited by these visible signs of religion and piety to the contemplation of the most sublime matters which are hidden in this sacrifice." 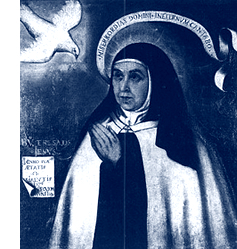 I am teaching St. Teresa of Avila and St. John of the Cross at Holy Apostles College and Seminary this semester. They both endlessly admonished against chatter. Since I am a chatter-box – and this for 73 years – I was alarmed. What? I can never, never, be united to God unless I get rid of this habit! I asked a wise mentor and he said this, “Don’t try to talk less. Try, instead, to love silence more!” And what the Holy Spirit told me was to watch my outer and also interior conversations to be more silent. Today is a beautiful day to start over again on this attempt to follow the Holy Spirit and beg for the grace to love silence more. It happens that yesterday was full of stress of all kinds and that stress is following me today. My tendency under stress is to vent it through chatter with one person after another. Typing this blog in silence instead of calling up one more audience for my woes is a step toward greater silence.